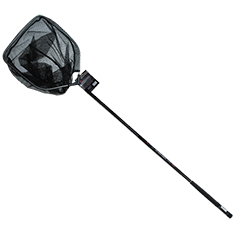 The Big T Duralite Crappie Net features a 3 piece handle with twist locking sections. Available in three models. All heads are 16"x20". Small Mesh - This rubber coated nylon head is 18" deep and has small 1/4" holes that keep those jigs in the basket. Large Mesh - This rubber coated nylon head is the lightest weight available. Mesh - Lightest weight rubber mesh net on the market at just 19 oz. total weight.